Snacks! officially opened in Ballard yesterday, in the back of the small parking lot next to King's Hardware on Ballard Ave. The name says it all—Snacks! has every kind of treat you could possibly be craving to beat the midday heat or sop up all the late-night liquor. The store was opened by Dante Rivera, of the beloved hotdog cart Dante's Inferno Hotdogs. 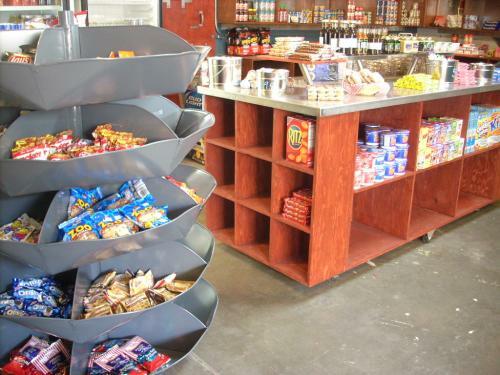 Besides stocking everything from milk and cookies to wine and beer, Snacks! 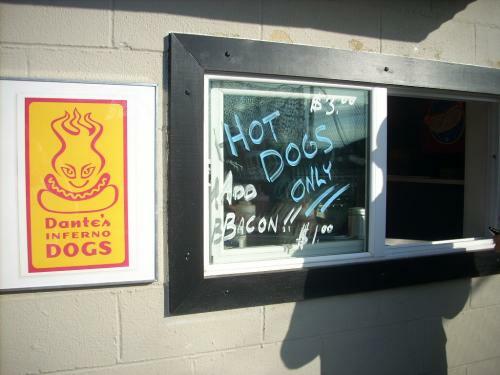 is also serving up Dante's dogs, with all the fixings (and they've even got a walk-up hot dog window for quicker service). 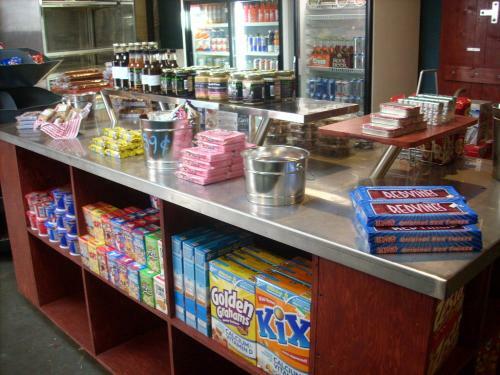 Inside, the store's inventory includes a lot of basics—drinks, cookies, chips, cereal, candy, some quick dinner items, and even Pepto Bismol and Tums, should you get a little carried away. But they'll be constantly adding new items, including a better selection of beer and wine (and possibly microbrews), as well as goods from the Ballard Farmer's Market vendors (they're already offering Zane and Zack's sauces and Honey! I'm Home Catering treats). And if they still don't have something to quiet your cravings? Then you're welcome to jot down whatever your heart desires on their big "Wish List" hanging on the door. AND HERE IS THE BEST PART: Snacks! 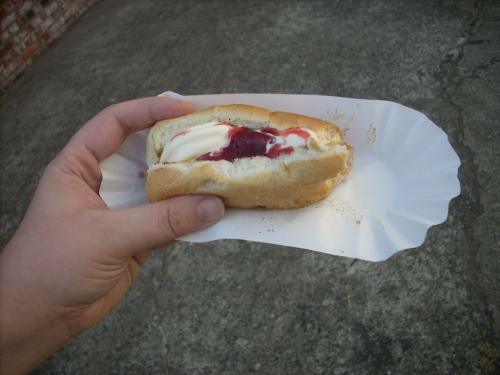 is home to Dante's latest invention, the Chilly Dog, which is a surprisingly delicious treat that involves ice cream and a hot dog bun. They start with a lightly toasted, soft bun. 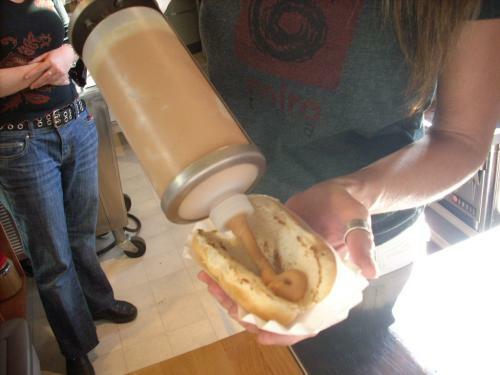 Then they add a thick layer of smooth peanut butter via a peanut butter gun (PEANUT BUTTER GUN!). Next, they layer on a fat stripe of soft serve ice cream (chocolate, vanilla, or swirl), and top it off with a generous drizzle of strawberry jelly. Seems weird, right? It's DELICIOUS! The bun gets all chewy and sweet as the peanut butter and ice cream melt into it. And the cool, creamy soft serve against the toasty warm bread is absolute heaven. 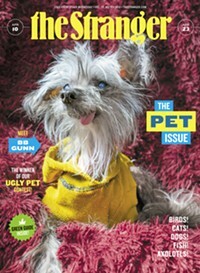 They also have a chocolate and peanut butter version. But if you're not brave enough to try it, stick with the Otter Pops. They've got those too. Snacks! is open Mon-Thurs 10 am-8 pm, Fri-Sat 10 am-2:30 am, and Sunday 10 am-5 pm.